Ecological disasters that affect the Earth on a global scale have been important to me for a long while now. Not because I love to see disasters or that I am a nature freak – but because I see an absolute lack of attention on these issues and I know, being a rational human being, that large ecological disasters need to be addressed – and ecological disasters involving our water is huge. Earlier I wrote an entry on the dilapidated Aral Sea which civilization hides what remains of the skeleton in countries forgotten or mocked. Ecological disasters – total and utter disasters – are a massive blind spot in the vision of civilization. 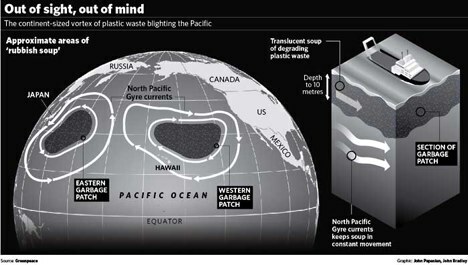 The North Pacific Garbage Patch is easily one of the top 5 blind spots of civilization. Everyday civilization cheerleads over the material benefits it has provided to humanity. Cars, money, alcohol, drugs, toys, conversation-pieces, an amazing array of food, plumbing, sneakers, clothes, the list is literally endless. From the depths of South America and Mexico immigrants team towards the United States in droves grasping for the coattails of the lifestyle civilization has provided the “Western” world for the last century. In China and other Southeast Asian countries people are willing to work literally for pennies for a chance at the civilized lifestyle – the chance to get material possessions to miraculously appear like those in the western culture. Yet the Achilles heal of civilization can be summed up in one sentence: There are infinite desires on this finite planet. Yet Civilization is going full-steam ahead at creating a globalized world and economy. The blood of the Civilized Beast? Oil. It courses thick and hot through the veins as it is at the root of our transportation, which we all know, but it is also at the root of something less-thought-about but more prevalent than gas – plastics. Plastic comes from oil and civilization has found no end for its uses. If we stopped using everything that used plastic today we wouldn’t have computers, cars, medical equipment, cookware, most bottles, most supermarket bags, and so much more. When you have a substance that is so depended on by literally billions of people, but yet is so disposable is the point when you have a problem – that is common sense. We are at that point. We have a problem. 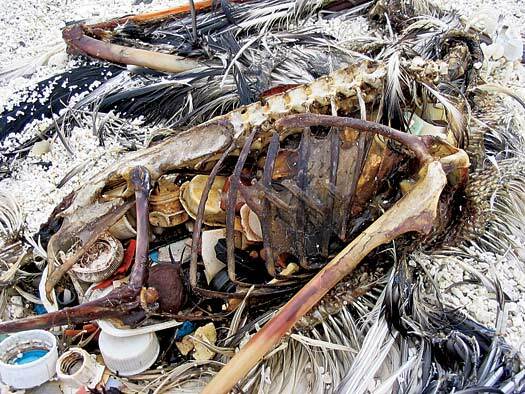 The North Pacific Garbage Patch, the Toxic Soup, Pacific Trash Vortex, Garbage Island, and the Great Pacific Garbage Patch are just some names that have referred to this problem. And it’s a problem that is still in its infancy to Civilization (which always has something more important to deal with than problems – like profit). The fact that this problem doesn’t even have just one common name shows how unaddressed this problem really is. People can say 9/11 and everybody knows exactly what you’re talking about, but if you start asking people about the North Pacific Garbage Patch many will blankly stare and wait for you to “preach” to them and walk away deeming you as a hippie or environmentalist. Yet 9/11 was two (albeit tall) buildings that only affected people psychologically (outside of those who were actually victims of the attack), but 9/11 did not affect those who watched it on television (over and over and over again) physically – the North Pacific Garbage Patch is affecting us all physically. 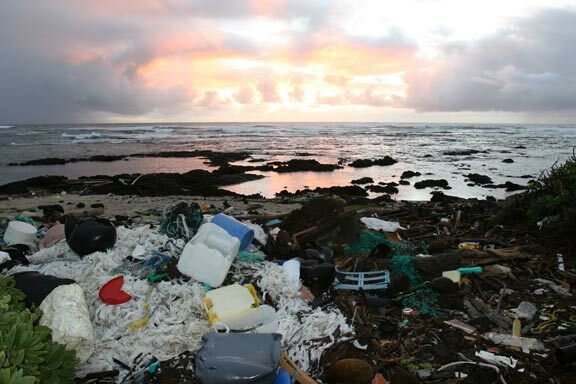 So what is the North Pacific Garbage Patch? Articles found sparsely across the web will all tell you virtually the same thing. Just like a flushing toilet there is a giant rotating vortex in the middle of the substantial Pacific as you can see in the picture. And like massive whirlpools the size of continents will do, they will collect debris from all 4 corners of the ocean and slowly whirl towards the center. This whirlpool is known as the North Pacific Gyre and at the center of it hundreds of thousands of square acres are covered in our plastic. Yes – the plastic you used to cover your leftovers last night, the plastic found around your vitamin water, the plastic bags you brought home from the store, and that plastic trinket you threw away last year and never thought twice about. Slowly it meanders around the gyre toward the center like a black hole. The comparison to the black hole falls apart when we get to the center. While matter seems to disappear forever once it passes the event-horizon of a black hole, the matter of the North Pacific Gyre simply collects forever. I’m not going to pretend like I’m the expert or that I can tell you more about the garbage patch than others, this entry is more than just simply shouting “Hey – Garbage Patch everyone – big problem!” That job has been done relatively well by few progressive newspapers, but are outshadowed by VBS.TV. 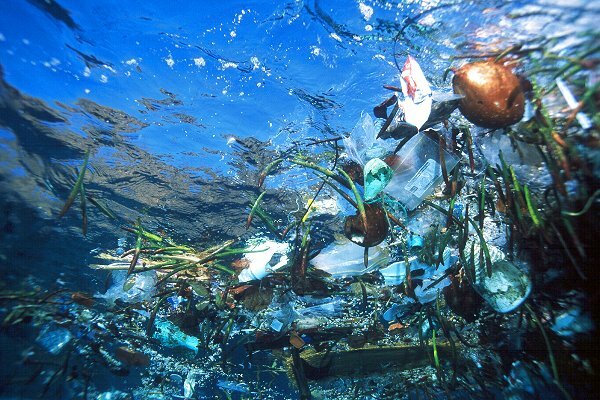 This video by VBS.TV can give you the best information on the North Pacific Garbage Patch to date. In fact I was a little disappointed when I saw the video because I had this entry planned long before the video came out. But obviously everything that is right comes from that video. VBS.TV reports on the things that our multi-billion dollar corporate media empires should be reporting on. They wreak of real people who are simply interested in sharing the world with the world. And it’s all for free. Since that documentary can show you more than I could ever show you on the North Pacific Garbage Patch I want to take this to the next step. What that documentary shows is frightening to humanity. You hear them speak about the “money shot,” a trail of garbage as far as the eye can see, and how alas, it never was to be. This is because Civilization has stopped giving us a tangible visible enemy, this enemy lurks under the waves and is slowly breaking apart, but not becoming part of the environment, just becoming smaller pieces of plastic. All of this plastic is floating to an area of the ocean that most of the world has forgotten about – an area twice the size of Texas to an area twice the size of the United States (still no serious studies done on it yet). It may be a large area but very few ocean species live there and humans rarely need to ship or boat through it. So simply because it is owned by no one and isn’t highly traveled, it has become nonexistent to us. Ultimately we have found a garbage dump that costs nothing and is extremely large to fill. Of course the cost is nothing if you only calculate it in dollars – which is unfortunately still the ignorant way of civilization. Our plastic trash has become an epidemic changing the genetics of animals and humans as well as creating vast stretches of beaches filled with garbage. If I’m going to make the claim that it is indeed changing genetics then I should have to verify this statement. Within that VBS.TV video there is a clip at the end labeled “Extra” in which they ask a Marine Biologist which cites studies done with animals that have been exposed to bisphenol A. But – people are going to say what they want to say, right? After all you’ve been drinking from and using plastic your whole life and you aren’t out buying bras or giving birth, are you? The unfortunate reality of this situation is that the negative affects have already began to settle on the human race. Throughout humankind the ratio between males to females have always always always been 1:1. It’s a coin-flip. 50/50. There has been nothing throughout the course of OUR ENTIRE SPECIES that has thrown us off this virtually perfect balance between men and women. Theoretically the idea of a soul-mate exists, the idea that every man could find a woman and every woman could find a man to thrive and prosper happily ever after. But now – that is changing – and of course it would have to begin with those who never accepted plastic into their lives like we do now. The Inuit now have a birth ratio of 1 boy to every 2 girls. The article vaguely puts “Man-made chemicals” at the root of this issue. However with our brief crash course on bisphenol A and the Pacific Garbage Patch I think we can begin to draw some logical cause-and-effect relationships. Why? If you noticed in the VBS.TV documentary they had a researcher on board collecting the plastic in glass jars. Why was he doing this? He was measuring the ratio of zooplankton, the most basic food in the ocean, to plastic. Why is this significant? Because more complex animals like to eat the plankton. The problem is with all animals (humans included) is that we’re lazy and if there is something more convenient to eat then why not eat that instead? Why go home and cook a perfectly done steak when you can stop at McDonalds? Are you trading both taste and quality for convenience? Yes. Animals do the same thing. There is so much plastic in the North Pacific Gyre that there is roughly 10 pounds of plastic for every 1 pound of plankton. In Part 10 of the VBS.TV video he shows a sample of about 1000 to 1 ratio. Once again, so what? Small fish are as lazy as people and instead of eating McDonalds they choose to eat plastic, what’s the big deal? Aside from plastic having no nutritional value and doesn’t digest (similar to McDonalds again, har har har) plastic also happens to be a convenient spongy absorber of some of the most toxic chemicals on the planet (once again Humanity and Civilization may take a bow for creating these personal Frankensteins). What kind of chemicals? PCBs, DDTs, and many other pesticides and poisonous chemicals created from around the world. Animals consume these. And again, the ignorant will drum, “So what!? It’s still not us that has the problem!” But that is not true. Now we have plastic and poison sitting inside of billions of species of fish, birds, and mammals because as one consumes the other up the food chain the plastic and poisons remain part of their system. And these are the same animals that we eventually end up eating. So why is it affecting the Inuit first? Because they eat directly from the ocean and their birthrate is telling us that plastic has permeated the ocean so severely that is is affecting land-dwelling animals – us – humans. If this continues we will be forcing ourselves, our children, and their children to eat the poison and plastic created by us and our prior generations for whimsical convenience. Again – there is no rate of slowing down, there is no attempt at removing plastics from our lives. We have wedded to it as Siamese twins are wedded to each other and we will influence each other similarly. 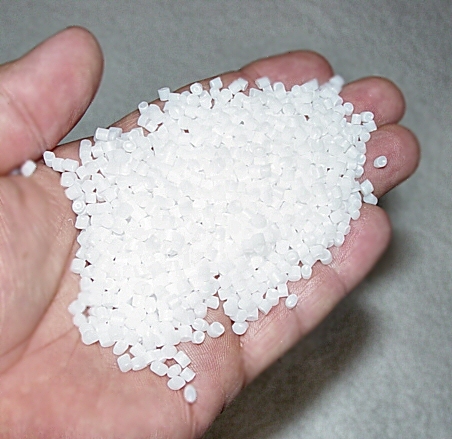 Plastic pellets, which create every plastic thing you know, are created and sold with no worry of regulations, with no worry of shutting down. 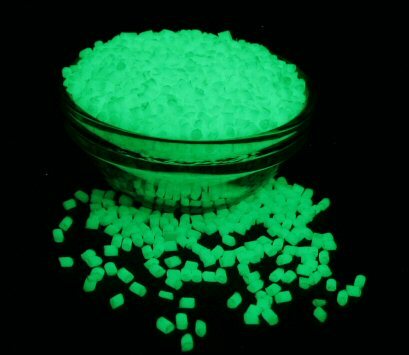 The picture to the right shows us how novel plastic is – you can even purchase pellets that glow in the dark! Well how cool is that!? Meanwhile it is getting broken down into invisible chunks in the ocean and infecting life as we know it. What I really wanted to focus on though is a new way of thinking that needs to come from you – the individual. Nobody can rid their life completely of plastic, but first things first, people need to know that this is a serious serious serious threat to both humanity and life as we know it. We need to push news organizations to cover the North Pacific Garbage Patch and tell our governments (all our governments) to start doing something to fix it, and we need to openly know all of the problems it is causing us. Nobody within the civilized world is innocent – indeed those who are innocent, like the Inuit, are the first to deserve compensation. We need to know the scale of the problem. We need to know what we can do with it if cleaning it is virtually impossible. We need to become creative in a positive and progressive way. How do we do that? Not like this. That is a link to a Globe-and-Mail article on the North Pacific Garbage Patch. Do you want to read about it? Do you want to learn more about it? Well too bad because unless you’re going to cough up $5, you’re NOT going to read it. And guess how many people are willing to pay $5 to read an article? None with a life, I’ll answer you that. Topics like the North Pacific Garbage Patch can NOT GET OUT SOON ENOUGH. In fact, the government should be paying people to stand on sidewalks shouting this at people. The article that got me suspicious was this article: Why Journalism is Failing the Public on the Risk from Plastic. So why does STATS.org say that journalism is failing the public on the risk from plastic? No – not because it’s not reporting on the giant sewage pit you can spy with a telescope from atop the Golden Gate Bridge (exaggeration guys, I dont know if that’s true), but instead it’s because they are fretting TOO MUCH about plastic. The article comes to sooth you from the aggressive media attacks on the evils of plastic. Wait, what? Since when does the media talk about plastic – the most pervasive and essential item to the entire civilized world? Well actually, Google Trends reveals that the media actually almost never talks about plastic at all, and it’s spoken far less about than Iraq – which only affects the people who are in the country. So how is the media being “highly selective and judgmental”? Well actually they were just simply reporting the findings of the government, such as the scientific study I linked above, and that Canada is considering banning BPAs. But STATS.org takes you down a dark path of twisted words and questionable logic, but that’s okay, you don’t have to waste your time reading that BS – they bold and italicize the only words you need to know: some concern, some concern, negligible concern, negligible concern, minimal concern, possibility but not a certainty, the panel then raised the Tolerable Daily Intake of BPA, not only not to ban BPA but to increase the level permitted. Those are just some of the terms they skew this “scientific” article with. They fill you with doubts and ideas that because plastics are increased somewhere that it still doesn’t have a long-term affect. All of those concerns (which the article is happy to dismiss to focus on the probability they just created using those terms) say nothing about long-term exposure to the environment. NONE of them. They all focus on the fact that if you go and touch BPA right now that you will not be infected and murdered. So I looked at the Staff of “STATS.org” because there seemed nothing unbias about that article at all. A simple Google search of the President and the #1 result is from a website known as Sourcewatch, with the slogan “Your Guide to Names Behind the News” – interesting. S. Robert Lichter is the president of STATS.org and in the past was strongly affiliated with the American Enterprise Institute which “succeeds in placing its people in influential governmental positions.” Additionally the American Enterprise Institute is a basis for neoconservatives and is extremely pro-business (and pro-plastic! what’s business without plastic?). And still S. Robert Lichter is a paid consultant of Fox News, the right-wing news source in the media. And though STATS.org touts being used by influential news organizations S. Robert Lichter condemns Peter Arnett, who has a solid history of reporting war for what it really is – someone who taught us all what real news reporting is. In this day and age it does not take very many brain cells to connect S. Robert Lichter to the current, lying, economy-ruining, big-business, torture-promoting, checks-and-balances-avoiding neoconservatives. Yet it is his website that is the source for a website called “FACTSONPLASTIC.COM.” It is obvious that he has no desire to see plastics being treated with unbiased factual information, which is why whoever he’s affiliated with created such a deceiving and misleading website. This is what needs to change! It’s sad for humanity to allow people like S. Robert Lichter to have such power even though it is clear he has a heavy, uninformed bias. It’s sick that we allow humans such as above to determine the life of us and generations to come of all species. This isn’t a forest fire – this is plastic – it doesn’t go away and it’s changing, poisoning, and killing everything. But one way to begin to be progressive about this is to get the word out. In the VBS.TV video the person getting the samples of plankton-to-plastic said that it’s impossible to clean or fix. But I’m going to have a little more faith in humanity than that. A start is how simply this teenager found a way to make plastic degrade in 3 months time. Instead of never. That’s a good first step. I don’t have the answers, but it’s high time we make plastic the forefront of our attention. Logically, from looking at the pieces of plastic picked up on the VBS.TV documentary and knowing the true scale of plastic-to-plankton, knowing the “concerns” from scientists across the board on plastic, and the result of the Inuit birth rate, there is virtually no doubt in my mind whether plastic is harmful. While factsonplastics.com tries to focus on whether a baby bottle will turn your baby into a disfigured monster, the facts are it is being used as a food source by animals, is absorbing toxins, and is likely the cause behind high female birth rate. ***Update*** I got a couple of comments that seem literally offended by this entry – it’s like the same kind of offense you see when you pick on someone’s mom. Let me clear something up quick – I’m not saying we need to scrap everything we’ve ever progressed with and we should wait for trees to fall down naturally and live under them like cavemen, I’m not being unrealistic here… however I AM making the argument that we can do way way better than this. For example – Coal is a dirty, cancerous, and inefficient, however during the early 20th century it was the staple of industrialization. In England it would coat buildings black with soot and cause major health problems for those living nearby. Now is it WRONG for people to recognize the dangers of coal? And is it WRONG for people to want something more energy efficient and healthy? Is it anti-civilization to want something better for humanity and the world? Plastic is unsustainable, isn’t biodegradable, and has significant dangers if we continue or increase our usage. Additionally oil deposits will not be around forever – why would anyone be upset at a movement for a cleaner, healthier, and sustainable way of living? That is all I’m looking for – it’s for my health as well as yours – I’m just being greedy for all of us.